“I WAS ONE-THOUSAND percent certain that I would take the penalty in that way and that I would score.” That is the matter-of-fact assessment of one of the most iconic images of an international football tournament. Antonín Panenka, a gifted midfielder playing for Czechoslovakia in the 1976 European Championship final against West Germany, had only one thought in his mind when he stepped up to take the decisive spot-kick in the penalty shoot-out. This certainty was born out of a tried and tested technique, rather than the maverick and reckless attitude that myth and legend has helped promote. As he stepped up to take his penalty, his technique was still unknown internationally. That was about to drastically change. With one delicate dink of his right foot, Panenka would write his name into the football lexicon, and make himself an icon of the game. In a lengthy career with one of Prague’s smaller clubs, Bohemians Praha, for whom he had initially signed as a child in 1967, Panenka was renowned for the quality of his passing and free-kick taking, rather than his pace or work ethic. He wasn’t one noted for the diligence of his defensive duties. Tracking back was something for the less talented players to deal with, and as for other destructive rather than creative aspects of the game: “I hated tackling.” But he was able to set up numerous goals for his team. His passing ability and inventive eye meant that his team-mates forgave any dereliction of defence. In 230 appearances for the club, he notched an impressive 76 goals – a handful of which came from the penalty spot – and created many more. The vagaries of the strict transfer system in communist Czechoslovakia meant that a move to one of Prague’s grander clubs – Sparta or Dukla – was never on the cards, let alone a move abroad. International transfers were reserved for those who had served their time at home – the over 30s only. But it was at Bohemians where the seeds of the Panenka penalty were sown and developed. His ability with a dead ball had meant that he had been the team’s penalty taker for some time, but prior to 1974 his success rate was no more impressive than anyone else’s. In a Czechoslovak league game against Plzeň that year he missed a penalty. The referee had spotted an infringement by a Plzeň player ordered a retake, but Panenka missed that too. He did score from a third penalty later in the game but was so angered by his earlier misses than he decided to step up his penalty taking practice. And so the delicate chip, slowly down the centre of the goal, was the result. “It’s always been a fight between shooter and keeper – who can keep his nerve the longest? No keeper will stay in the centre – that’s what I based my strategy on.” The key to success was to persuade the goalkeeper that you were going to take the kick more conventionally. “I always tried to do it with my movement or with my eye. I wanted to get him where I wanted.” If the goalkeeper committed to one side or the other, the penalty was bound to succeed. Panenka tried his new technique in his regular post-training duels with Hruška. “It worked like a charm,” recalled Panenka. “I started to gain weight because I was winning the bets.” Having developed a degree of confidence in the tactic Panenka gradually introduced it into matches. 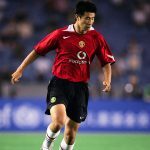 He started taking the chipped penalty in friendly matches and then in league games as his confidence grew and he felt he was perfecting the technique. Even once the method was expected and anticipated by the opposition, it still proved effective. He scored past his international teammate, Ivo Viktor, just a month before the Euro 1976 finals. Viktor knew all about the chip down the middle by this point, but was still unable to save it. It takes some courage for a goalkeeper to stand still and expect a slow chip. Viktor knew what might be coming, but still dived to one side, drawn in by Panenka’s run-up, body angle and speed of approach. In the days before wall-to-wall coverage of football, Panenka’s penalty style remained something of a secret to those outside Czechoslovakia. At the finals of the European Championship of 1976, it would be a secret no longer. In 1976, the European Championship was no lengthy extravaganza with many of the continent’s finest in attendance. Having come through qualifying groups and then two-legged quarter-final playoffs, the finals in Yugoslavia were a mere four team show; semi-finals and a final. Czechoslovakia in 1976 were a terrific side. As well as Panenka, their creative fulcrum, and Viktor in goal, there were strikers Zdeněk Nehoda and Marián Masný, tough-tackling Ján Pivarnik and Panenka’s midfield colleague Jozef Móder. 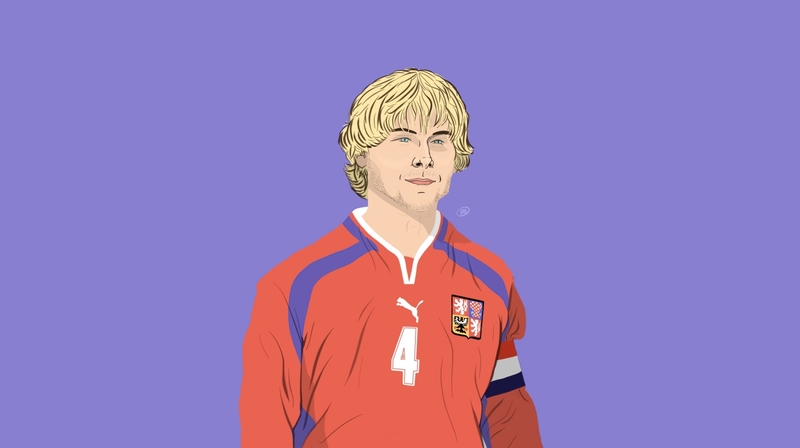 Led by coach Václav Ježek, a Slovak, and captain Tonda Ondruš, a Czech, a routinely distanced and occasionally divided squad became united and focused and achieved a string of fine results. They had gone 20 matches unbeaten when they arrived at Euro 76 – a fine achievement without a doubt and a sign of a more settled squad. Where previously the Slovaks and Czechs ate apart and even had separate tactical discussions with the coaches, now the squad was as one, focused on their common goal. The 1976 squad had only four Czechs, Panenka included, and the rest were Slovakian, but it was harmonious. They won their qualifying group ahead of England, before beating the Soviet Union in the quarter-finals. 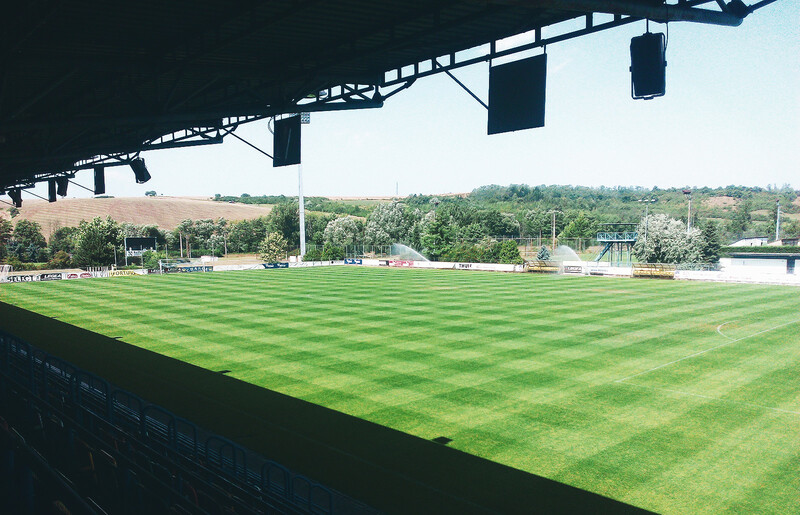 This brought them to the Maksimir Stadium in Zagreb for a semi-final in torrential rain against a Netherlands side that were in between two World Cup final appearances. It was a match that would see three red cards and four goals – all scored by a Czechoslovak player as captain Ondruš registered goals for both teams – with Czechoslovakia eventually winning 3-1 in extra-time, František Veselý sealing the win by rounding the Dutch keeper as the match neared its conclusion. In the other semi, West Germany, the reigning world champions, came from two goals down against the hosts Yugoslavia in Belgrade to force extra time before winning 4-2 – striker Dieter Müller grabbing an equaliser eight minutes from time and then adding two more in extra time for an impressive hat-trick. For all the Czech enterprise, it was the Germans who would be the overwhelming favourites in the final. But it was men in red who stormed into an early two-goal lead only for the Germans to pull one back before half an hour had been played. And there the scores remained until one agonising minute from time. With Czechoslovakia having one hand on the trophy, Bernd Hölzenbein scored a dramatic and oh-so-late equaliser from a corner. Just as in their semi-final, West Germany had fought back from two goals down. Extra-time once again. Czechoslovakia went first, Masný beating Sepp Maier comfortably. The next six kicks were all successful, meaning that as Uli Hoeneß stepped up to take West Germany’s fourth, his side were trailing 4-3. His shot flew wildly over the bar and suddenly Czechoslovakia were at match point. This was the moment for Antonin Panenka. The moment he’d been preparing for with all those hours of practice spent perfecting his technique over the previous two years. 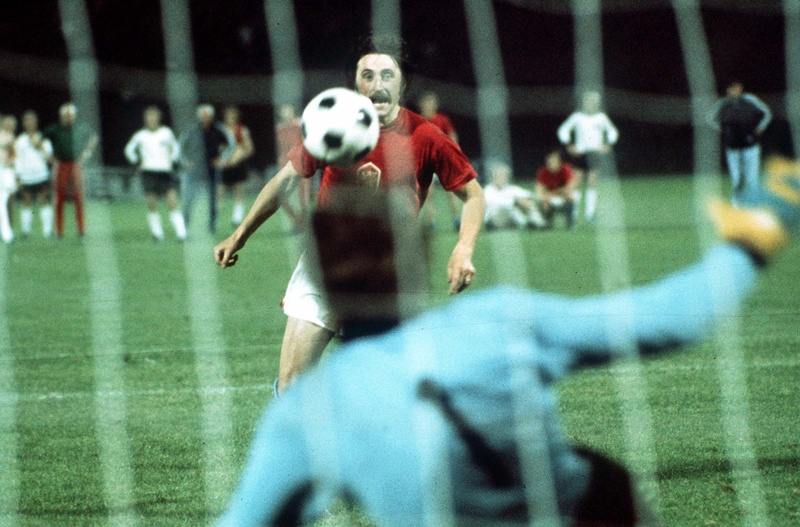 The possibility of a shoot-out and Panenka’s chip had been the subject of a discussion earlier that day in the hotel room shared by Panenka and Ivo Viktor. “He told me that it was too risky and that if I did it, he wouldn’t allow me into the room.” Panenka, as we know, ignored this advice. Quite so. Imitation is the sincerest form of flattery, as the saying goes, and several of the game’s greats, and a few not so greats, have copied the Panenka. Some of them, like Panenka himself, have done it on the biggest of stages. None more so than the penalty scored by Zinedine Zidane early on in the 2006 World Cup final. The likes of Sergio Ramos, Francesco Totti and Andrea Pirlo have also scored fine Panenka’s in European Championship knockout matches. “I think the penalty still has incredible success,” declared Panenka, not without foundation. He admits to feelings of delight when he sees others performing his penalty, and hearing it referred to as a “Panenka” – “If it were patentable, I’d have patented it,” he joked. That eponymous title makes him one of a very select band of players to have a move named after them. There is the Cruyff turn and Zidane’s roulette, but the difference between those examples and Panenka’s penalty is that they don’t necessarily score goals and they don’t decide matches. The Panenka does. Even more than that, the potential impact of a Panenka – particularly in a penalty shoot-out – has a greater value than just the goal it results in. A handy side effect is a damning psychological impact on the opposition – an impact that is all the greater when used in a shoot-out. A successful Panenka is frequently followed by a miss for the opposition. Witness Andrea Pirlo’s effort in the Euro 2012 quarter-final shoot-out against England. England had been leading at the time, but Pirlo’s dink shifted the momentum of the shoot-out utterly. Ashley Young was next up, missed, and the rest is history. It was the same the night before when Sergio Ramos scored his Panenka effort in the Spain-Portugal match, leaving Bruno Alves to miss the subsequent shot. Panenka’s profile had risen with his exploits at Euro 76, but he remained at Bohemians for another five years before he was belatedly allowed to move abroad at the age of 32. There had been offers from clubs in Spain, Belgium and England, but he went instead to Austria to play for Rapid Vienna. There he added some silverware to his collection with two league titles and a cup win, before playing against Everton in the 1985 European Cup Winners’ Cup final. He now spends his time in an ambassadorial role for Bohemians, when he’s not fielding numerous interview questions about his famous spot-kick. There’s little doubting that his famous dink of the ball has overshadowed the rest of what was a very impressive career, something Panenka is slightly torn over. As a player with the determination to entertain and delight the watching public, blessed with the touch and vision of a highly skilled exponent, it was, of course, these attributes that led him to develop his penalty in the first place. It is a skill that looks far easier than it is in practice, but one which is as deadly today as it was when Panenka first developed it. “It’s a big weapon. If you do it properly and with the right timing, the success is 100%.” And every time it is used again, Panenka’s name, and his majestic, magnificent penalty, will be remembered once more.